With just three days left for the second phase of Lok Sabha elections, the pace of campaigning has been intensified by political parties in Hojai district under No. 10 Nagaon parliamentary constituency. Hojai district is considered as the hub of linguistic and religious minority politics in central Assam in Brahmaputra valley. Hojai district, which comprises three LACs – Hojai, Jamunamukh and Lumding – plays a significant role in electing the MP of Nagaon Lok Sabha constituency. As per ground reports, it’s clear that this time there will be a tough contest between the party candidates of the Bharatiya Janta Party (BJP) and the Indian National Congress (INC) for the seat as the All India United Democratic Front (AIUDF) has not fielded any candidate in this constituency, which will directly benefit the Congress. For the Nagaon Lok Sabha seat, the BJP has fielded its Nagaon MLA Rupak Sarmah replacing its sitting MP Rajen Gohain who has been MP from the constituency for the last 20 years. Former Assam minister Pradyut Bordoloi is the Congress candidate for the seat. Both the BJP and the Congress are making all-out efforts to woo voters and win the seat. In Hojai district, seeking votes for party candidate Rupak Sarmah, Uttar Pradesh chief minister Yogi Adityanath campaigned at Bihutolhi playground in Hojai on April 6, NEDA convenot and Assam finance minister Himanta Biswa Sarma campaigned at No. 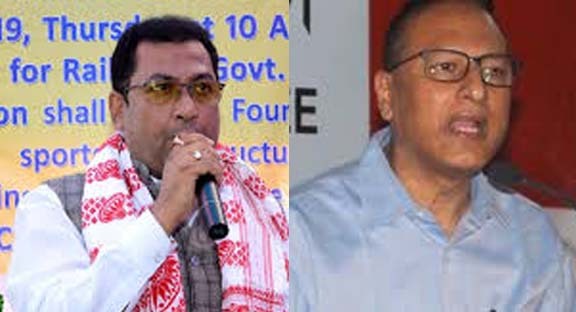 1 Kaki on April 9 and at Lanka on April 10, Bodoland Peoples’ Front (BPF) chief Hagrama Mohilary campaigned on April 11 at Kaki, Assam chief minister Sarbananda Sonowal campaigned on April 12 at Jugijaan and on April 13 at Doboka, star campaigner and noted actress Rupa Ganguly campaigned on April 13 at Lumindg. On the otherhand, Samaguri MLA Rakibul Hussain and former minister Dr. Ardhendu Kumar Dey have been campaigning for Congress candidate Pradyut Bordoloi. No central leader or celebrity has been sent to Hojai district by the Congress till date to campaign for the party candidate as compared to the BJP. However, both the Congress party and BJP are pouring heart and soul to attract voters in favour of their party candidate by organising meetings in every nook and corner. Whereas denizens of Hojai district are not ready to say in whose favour they would cast their vote, they are of the view that, they are listening to each side and as per their own discretion they will exercise their franchise. For the BJP, retaining the seat, which has been in its hands for the last 20 years, is a big challenege. The saffron party has intensified campaigning in the constituency by organising massive rallies while Congress candidate Bordoloi, which is fluent in Bengali, has been trying to draw the attention of the Bengali-speaking voters using their language. Now, both BJP and Congress are waiting for the polling day in second phase on April 18 seeking mandate for their party candidate.